-Read the excerpt below from the Foundation for Defense of Democracies president Cliff May. Imagine if [evangelical Christian leader] Pat Robertson called for the demolition of all the mosques in America. It would be front-page news. It would be on every network and cable news program. There would be a demand for Christians to denounce him, and denounce him they would — in the harshest terms. The President of the United States and other world leaders would weigh in, too. Rightly so. Some members of the Kuwaiti parliament have been seeking to demolish churches or at least prohibit the construction of new ones within that country’s borders. So the question arose: What does Sharia, Islamic law, have to say about this issue? A delegation from Kuwait asked the Saudi Grand Mufti for guidance. He replied that Kuwait is part of the Arabian Peninsula — and any churches on the Arabian Peninsula should indeed be destroyed because the alternative would be to approve of them. The Grand Mufti explained: “The Prophet (peace be upon him) commanded us, ‘Two religions shall not coexist in the Arabian Peninsula,’ so building [churches] in the first place is not valid because this Peninsula must be free from [any other religion. ]” In Saudi Arabia, of course, non-Islamic houses of worship were banned long ago and non-Muslims are prohibited from setting foot in Mecca and Medina. This should be emphasized: Al al-Sheikh is not the Arabian equivalent of some backwoods Florida pastor [who publicly burned a Koran in 2011 and was widely condemned by the media]. 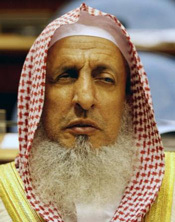 He is the highest religious authority in Saudi Arabia, where there is no separation of mosque and state, and the state religion is the ultra-orthodox/fundamentalist reading of Islam known as Wahhabism. He also is a member of the country’s leading religious family. In other words, his pronouncements represent the official position of Saudi Arabia – a country that, we have been told time and again, changed course after 9/11/01 and is now our ally and solidly in the anti-terrorism camp. Why are reporters [who cover] the State Department and the White House not asking administration officials whether they are troubled by Saudi Arabia’s senior religious authority meeting with supporters of al-Qaeda and telling them that, yes, Christian churches should be demolished? Why have reporters covering the UN decided these issues are of no concern to the so-called international community? How about the centers for “Islamic-Christian understanding” that have been established – with Saudi money – at such universities as Harvard and Georgetown: Do they suppose there is nothing here to understand – no need for any academic scrutiny of the Saudi/Wahhabi perspective on church-burning and relations with terrorist groups? My guess is that all of the above have persuaded themselves that here are more pressing issues to worry about, such as the world-wide epidemic of “Islamophobia” and the need to impose serious penalties on those responsible. I understand. I really do. 1. What types of bias has the media exhibited by not reporting on Al al-Sheikh’s pronouncement? Why do you think the U.S. media is ignoring this important story? Be specific.